Dynamic Design and Manufacturing, Inc., a leading Northern Colorado precision metal fabricator located outside of Denver, offers CNC laser cutting services, specializing in aerospace, national defense, medical, telecommunications, and process control instrumentation applications. Our CNC laser cutting services provide our clients worldwide with finished parts that meet their specific requirements and tolerances. We are ITAR compliant and our manufacturing processes are ISO 9001:2015 certified. At Dynamic Design and Manufacturing, we are proud of our reputation for manufacturing the highest quality precision metal parts that meet or exceed your expectations. Titanium’s high strength-weight, biocompatibility, and corrosion resistance properties have led to its use in a number of demanding industries, particularly in aerospace and medical device applications. Cutting with a CO2 laser provides the advantage of a precise and smooth cut done quickly, which makes it an appealing choice for many customers. 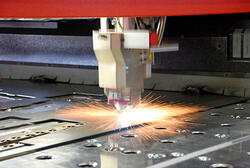 For our laser machining services, we use the Amada Pulsar LC2415 2500 Watt CO2 Laser. This advanced equipment in combination with our expertise allow us to consistently exceed our customers’ demands in a timely and cost effective manner. Without Repositioning 60" x 72"
Without Repositioning 61" x 99"
With Repositioning 61" x 198"
Positioning Accuracy & Repeatability: ± .005"
Dynamic Design and Manufacturing offers the highest quality precision laser cutting services at our 31,000 sq. ft. facility located in Niwot, Colorado in between Boulder and Longmont off of 119. Our state-of-the-art automated equipment and technology allow us to efficiently fabricate precision finished parts, integrating our CNC laser cutting services with machining, punching, rolling, welding, hardware installation, and finishing services. We work with a variety of materials, including stainless steel, carbon steel, aluminum, nickel alloys, and titanium alloys. Our engineering staff can work with you to achieve the most cost effective design for manufacturing and our experienced production staff will manufacture your parts to meet your specific requirements. We have the capacity to produce quantities from prototype through high-volume production runs. Dynamic Design and Manufacturing understands that the quality of your finished product is dependent on the quality of the components you use. Our expert engineering and production staffs are supported by our company-wide commitment to quality and customer satisfaction, and we are committed to providing you with parts that meet your exact requirements, delivered on time and on budget. Call today to see how our full suite of precision metal fabricating and machining services can help solve your manufacturing challenges.